A lot of times when you have a published campaign, especially some of the ones I’ve seen from Paizo, there are richly developed NPC villains that may have complex and fascinating motivations…. that the PC’s will probably steamroll right over without ever getting a glimpse of it. Perhaps one of my favorite examples of this was in the old Living Greyhawk module The Reckoning wherein a party of would-be waylayers are involved in a love triangle that can somewhat irregularly shift the targets of their attacks in mid-combat if you injured their would-be lover. I ran the combat several times, and only once did anyone figure it out. So how do you draw this material to the surface? Sometimes it’s right in the module: a journal, a note, or some box text. The other tools at your disposal vary depending on the resources you have at the ready, but a few ideas follow that can help tell your module’s story in its richest form. Clues: Sometimes, present or not in your module, you can take certain liberties to make sure that the party comes into the information and motivations of your NPCs. Perhaps an infatuated mercenary has sketches he has made of the beautiful mage that has hired him, or a pile of half-burned or crumpled attempts at poetry in the fireplace or behind his bed. Something you, as the GM, should become used to is the feeling that you are hammering your players over the head with these clues. In my experience, if you feel like it’s plainly obvious, your players will feel very proud of themselves when they deduce the “secret” after 10 minutes of contemplation. It’s plain as day from your side of the screen, but they’re dealing with a lot of abstract stimuli. Monologuing – This is perhaps the worst kind of obvious tripe, but trust me, its a tool in your GM toolkit that you need to use. An epic boss fight NEEDS to have this happen, so the villain takes on robust character and the PC’s can feel their hate for this guy. Further, it keeps him from being just a bundle of stats. I’ve fought several major villains who never said a word, and it amounted to bad GM’ing. But, the key here is DON’T JUST RESERVE THIS FOR MAJOR NPC’s. Trash talk happens, and it warms up NPC’s beyond just statistics, especially when they really have something to say. It needn’t be a speech, but a few words to tell that character’s story. With the star-crossed lovers, shouting out the name of the love lost as he is struck, or muttering, “I won’t leave her” may seem (again) heavy handed but it’ll be received as just enough for the players to get on the same page as you. The Rumor: Maybe the player hasn’t seen something, but rest assured in a small town, or in a society where information is currency, a barkeep, courtesan, beggar or child may have seen the way one NPC regards another, or perhaps overhears something said in anger or frustration. This could be delivered naturally as part of some other interaction with the information holder in question, or could be as obvious as a Knowledge (Local) roll, probably depending on how much time you want to spend on it. Cutscene: This can be done live, though it is often hard to do well. In a game where we rescued the Juliet to the bandit chief’s Romeo, the GM successfully pulled off a complex dialog by making little puppets with his hands. While hard to take too seriously, we got the story of their lost love that we might not otherwise have noticed, and it changed the fate of the bandit chief when we escaped and had the upper hand. He eventually evolved into an ally, which made a much better story than another defeated CR 3 encounter left behind in our wake. The content of a cutscene is just like we see in a movie. It is material that the characters do not see but the players are made aware of. It is not for all players. Some may not like it, some may not be able to separate what they know from what their characters know. But showing how they have left behind a clue for a pursuer, for example, may explain to them the unlikely events that follow when the bounty hunter appears on their doorstep, etc. These take some skill, and some good players. Never spoil any surprises – You can hint, but don’t solve the mystery. A cutscene or clue is to bring the player and the character up to speed with story developments, but not to catapult ahead to a conclusion. Think Empire Strikes Back when Obi-Wan says, “That boy is our last hope” and Yoda’s response, “No, there is another.” Whet their appetite. Know your players – Some people cannot handle knowing something and not using it. If you’re running a cutscene that contains sensitive information, beware of players that might metagame their way out of a challenge. Either know they’re good for it, or if not, lock them in before hand, then spring it on them right away, or don’t give them enough in the cutscene to metagame with. Don’t overdo it – This tool may have been around forever, but the way we’re used to seeing it in the 20th and 21st centuries is through film. Use it to tell your story, but be mindful of pacing, necessity, and its overall influence on your game. Plan it out, then give this a try next time you read the rich background of someone who is going to die after about 3 rounds of combat. See if it changes the way the characters deal with that NPC, and check to see if the players do anything differently either. You might be surprised at the outcome. Unless you live under a rock somewhere, you’ve no doubt heard that Reaper Miniatures is Kickstarting the second set of Bones miniatures. Once again, they’re offering a mega-pile of new Bones plastic miniatures at a very deep discount, and have a number of add-ons you can get for things like miniature cases and their line of awesome paints. This time around they are doing something new with their stretch goals: instead of a pile of all add-ons, they have the Core set, and — for now — two add-on ‘expansions’ to the Core set for $50 each. This is of course, in addition to some more add-ons. It’s an interesting way of doing it. Makes it easier, in one aspect, and gives people a wider variety of figures to choose from. Maybe it’s just me… but didn’t we JUST get our Bones like a week ago? Don’t get me wrong, I’m all in this time around as well. In my opinion, it’s a fantastic bargain and having received the miniatures in more or less the time promised, I can honestly say the quality is as good as I thought it would be for being plastic miniatures. The detail is impressive, they seem to hold paint well and the reviews I have seen have been, for the most part, positive. But… this time around there is some grumbling from the international (i.e. out of the US) purchasers because during the last Bones run, without a European distributor, Reaper had to pay more for shipping than anticipated. This time around, they are having the international customers pay exact shipping charges and have a new calculator for them to use… and it’s causing some negativity to flourish. I understand their frustration, but I don’t think that it will have much of an impact. It may encourage Reaper try to find a distributor, which would be a good thing, in my opinion… but there’s a vocal minority filling up the Kickstarter comments with negative feelings… and that’s a bad thing. By the time Bones 3 rolls along, I’m sure these issues will have been dealt with. In the meantime, we have a new set and a new Kickstarter to refresh every hour to see how far they’ve gotten in their stretch goals. When I go to a convention, I have all my miniatures packed in a nice case, secured in their places by foam and plastic. But in our weekly Pathfinder Reign of Winter adventure path home game, I have just the one miniature to cart around. I’d been just randomly throwing him in my gaming bag, but worried that the hands I’d swapped out would snap off with such a cavalier attitude. I’d seen this idea somewhere else, and decided to give it a try. Take an empty plastic dice box and cut a small piece of double-sided carpet tape and place on the extruded side. Firmly put your miniature on the tape and put the plastic box back over the top. Presto! Your friendly local wizard is protected from the pens, papers, pencils and Core Rulebooks smashing him into oblivion! Let me just start by saying, if you don’t know, The Wyvern’s Tale is just about the coolest Friendly Local Gaming Store I have ever seen. We just happen to be lucky enough to have it in our town of Asheville, North Carolina. Not only is it a great place to learn about and buy games, they ponied up during the Numenera kickstarter to be one of the premier retailers and have the creator Monte Cook, and the lead editor Shanna Germain in store to talk about the game, and run a session for us lucky few. 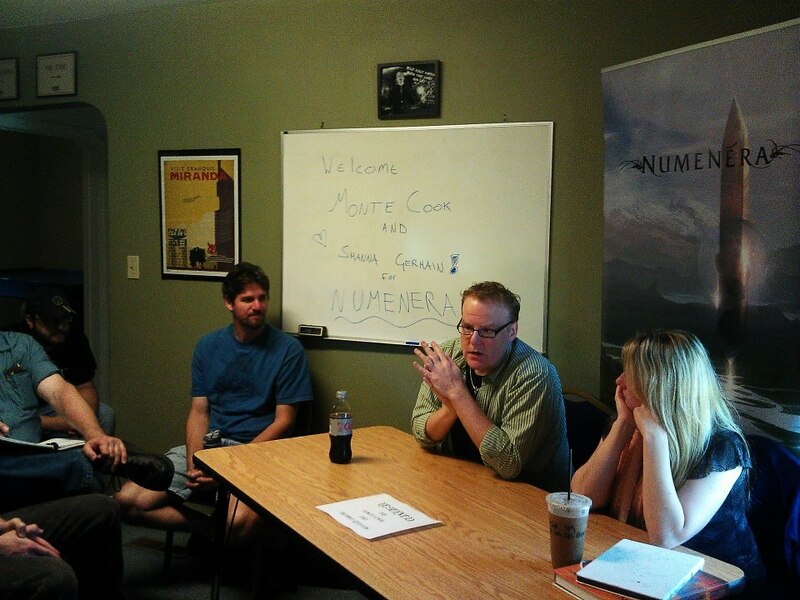 For those who don’t already know, Numenera is Monte Cook‘s latest RPG. The book is a work of art, both for the amazing art itself and the unique world and game system described therein. For those of you who don’t know Monte Cook, for shame! He is generally known for being the chief designer of Dungeons & Dragons 3.0, but he has a lot of project credits during his career. I will admit, I was not a backer of the kickstarter. I am a huge fan of RPGs in general, and had I done my research, I should have backed it to get in on all the goodies that came with it. But I was up to my ears in RPG books, and I thought my shelf didn’t have room for another rule system to try to keep straight in my head. Two of the other Skyland Games guys were in on it, but I was trying to keep Pathfinder rules separate from DCCRPG, and FATE, and Savage Worlds, and Traveller and Stars Without Number, and now Edge of the Empire. 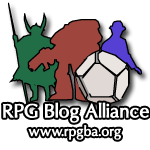 How many systems can the already crowded RPG market take? Clearly at least one more. Monte made this point in his talk as well. Tabletop roleplaying games were in trouble. Especially indie games trying to make it in a marketplace where you can no longer just put an ad in Dragon magazine and know that your core audience will see it. Enter kickstarter. Now games of all stripes can find their audience and you can prove that a product will be successful when backers vote with their dollars. Numenera is one such success story. 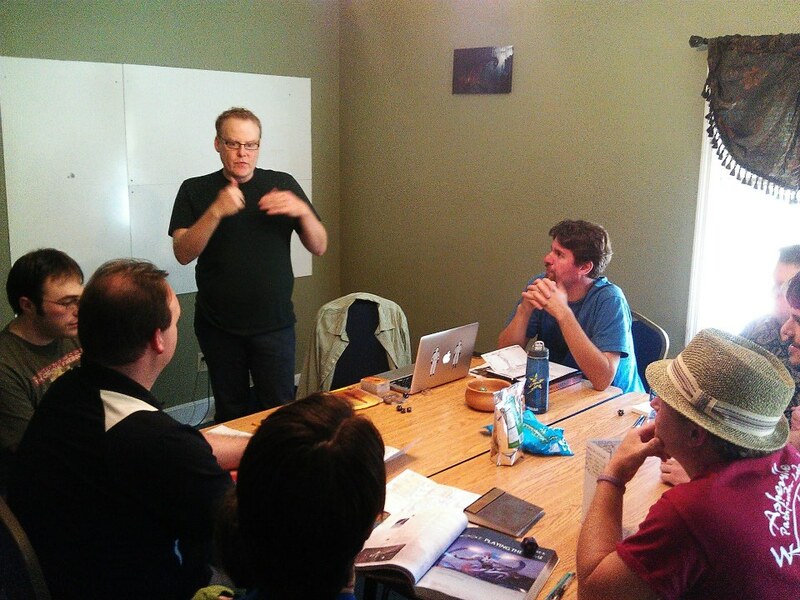 Numenera is a fascinating world and gaming system. Briefly, it is set in the far future in what is known as the 9th age. Incredibly advanced societies have risen and fallen eight times on this world, leaving behind traces of their power and technology. To me it was an intriguing blend of Dark Sun meets Gamma World meets Shadowrun. Their are only 3 types of characters, but many combinations allow you to make your PC your own. The character creation concept I think is one of the coolest ideas from the game. Any character in Numenera can be expressed in a sentence: I am a adjective noun. who verbs. For instance, the pre-gen I played in our very cool session with lead editor Shanna Germain was a Strong-willed Nano who wields power with precision. Each part of that statement has mechanical game effects, but also can stand on it’s own as a statement about the character. The noun is always one of the three character types or classes, the adjective is a character descriptor, and the verb is generally a special power or something that makes your PC unique. All have some in-game benefit attached to them, but often it makes a great summary statement about your character when you are introducing your PC to the table as a whole. The descriptor defines not only your starting equipment and a connection to one other party member, but also inabilities, or skills you lack that mechanically will be more difficult for your character during the game. The task resolution system is pretty straight forward. It is similar to Difficulty Checks in Pathfinder and DnD 4e. The GM sets a target number, and if you roll higher than it on a d20, you succeed. Here is the twist: the target number is the level of the task times 3. A fourth level task would have a difficulty of 12. However, that level of difficulty can be lowered by several factors. If you are trained in the task, it reduces the difficulty by one, making the target number 9. If another PC is trained in the task and uses their action to assist you, reduce it by one again, making the target number 6. Some pieces of equipment or artifacts can help you on checks as well, and some items will grant a +1 or maximum +2 bonus on a roll. Rather than going up to +3, the item just reduces the difficulty of the task by one, keeping the math simple. Another intriguing concept, the GM never rolls dice! If a creature or construct attacks you, you try and roll over a defense number. From our table’s experience, it seems like the key to Numenera is sensory descriptions. In this system more than any other I have ever played, it is up to the GM to not only describe what the players see, but what it smells like, feels like, and in my character’s case, tastes like. 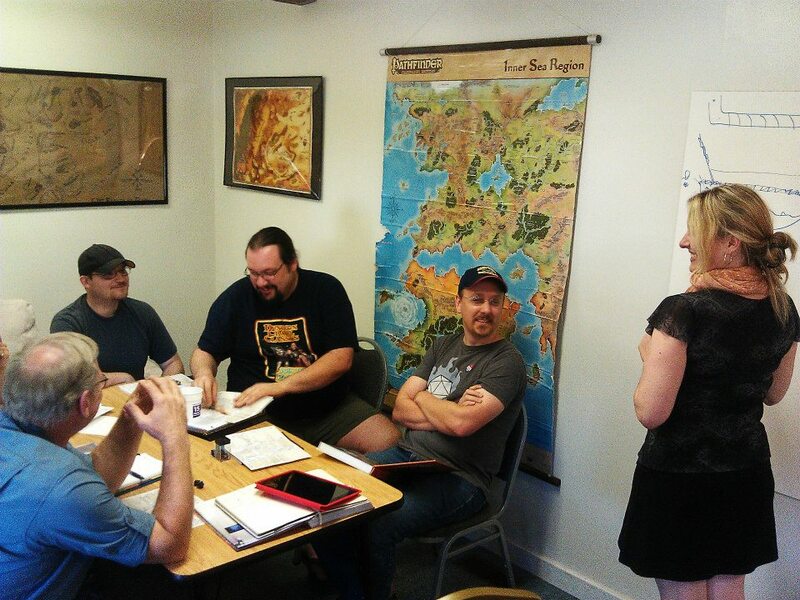 I’m sure Shanna had an amazing adventure planned for us, but many of us at the table were new to the system and just trying to figure out what we were supposed to be doing. Shanna provided us with the classic scenario of approaching a somewhat cobbled together suspension bridge crossing a river. This was no ordinary river, in that the liquid was green and smelled like burning tires. As one of our brave companions acrobatically ran across half the bridge and jumped to the other side, the green liquid rose to meet him. Since he rolled a natural 20, he was able to jump safely across without it touching him. To our horror, the liquid did not recede into the river but remained a column of goo underneath the bridge. Looking for ways to dodge whatever horrible fate would befall someone who fell in the river, our team noticed a pipeline running parallel above the bridge that we might affix a rope to and swing across. Also someone noticed some odd orange flowers that only grew in shady spots on either bank. While our intrepid party tried to rig some way to swing across and not fall in the goo, I ate the flowers, which instilled both a sense of euphoria, and a strange buzzing sound in my character’s head. Just as our plan to swing across the river was coming together, horrible osterich-like Ithsyn attacked on the far bank. Needless to say it took over three hours to cross the bridge, and I have no doubt we experienced about 20% of what Shanna had planned. It was great fun though, and the only time I’ve played an RPG with someone who was instrumental in its design and production. A huge thank you to the Wyvern’s Tale for making this event a reality, and to Monte Cook and Shanna Germain for making the trip out east to visit our awesome FLGS and run some tables for us. 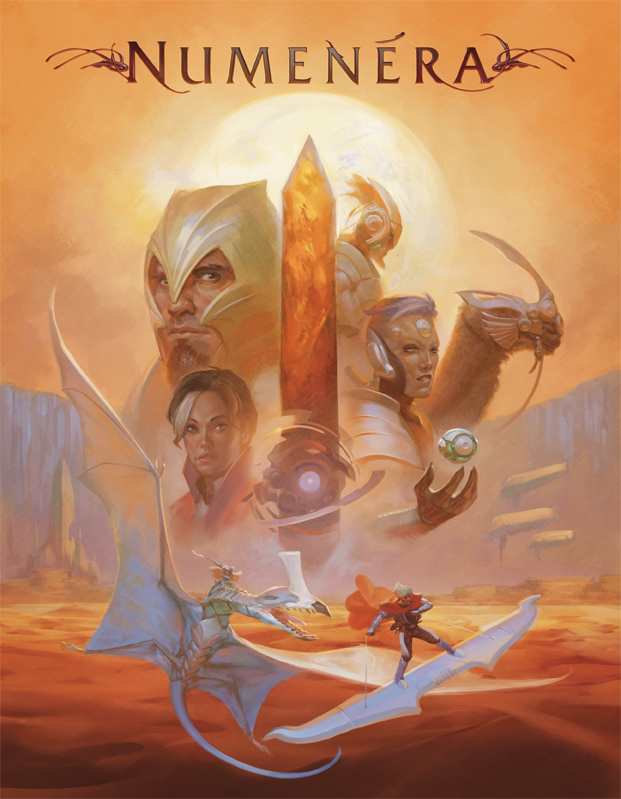 If you need a break from your typical swords and sorcery, or are eager to try something strange and beautiful, check out Numenera. Since reviewing Edge of the Empire, I’ve been playing and running and watching Star Wars almost exclusively. I’ve learned a few things and wanted to share them here for gamers looking to both run or play. I think the system does a great job at providing the tools to have a great game, but ultimately I’ve learned that a great Edge game is more of a conversation than any other RPG I’ve ever played. Due to the narrative and somewhat improvisational nature of the dice results, it can be a lot of pressure on the GM to come up with what each roll means. Once the players are used to the symbols on the dice and what cancels what, I would encourage the GMs to start a conversation, or maybe more clearly a negotiation of what the result means with their players; especially if nothing immediately comes to mind for the GM. This keeps players involved and invested in the action, even when it’s not their turn, they can actively try to come up with ways to spend advantage or threat. The conventional wisdom is players spend advantage, and GMs spend threat. I find it much more engaging for everyone if both parties suggest possible events for success or failure, advantage or threat. Encourage creative interpretations of the roll, and if the suggestion is either too weak or too powerful for the result, maybe modify it a bit but try to incorporate player ideas as much as possible. This game has the potential for nearly constant and frenetic action, but to keep the pace exciting the GM needs to keep some things in mind. One concept that really stuck with me from reading the FATE rpg core book is deciding when to call for a roll. I’ve found the best practice is to make a roll when failure is interesting. If you have the group in a part of an adventure where they absolutely have to succeed at a task or it derails the whole plot, don’t call for a roll. It just happens. For instance, the spaceport is exploding and the party has to find a ship to escape. Is there a suitable ship available? I would certainly hope so, otherwise the PCs blow up with no options, no need for a roll there. How fast can these smugglers, bounty hunters and thieves go through a preflight check and get that bird off the deck? Now it’s time for a roll. Does failure mean they die? Hopefully not. I would suggest failure in this case means they are able to get off the deck, but maybe some systems are damaged in the process, i.e. shields, weapons, sensors. Threat on a roll like this could cause system strain to the ship as the pre-flight routine is rushed; advantage could mean power is routed very effectively and could provide boost dice on subsequent checks to power up other systems or out maneuver pursuing craft. In my frenzy to learn about all things Star Wars, I’ve rewatched all the movies (even Phantom Menace. That is dedication!) and have watched most of the Clone Wars animated series. Something I noticed is that it almost always starts in media res, or in the middle of the action. This is great advice for an RPG session as well! Set the scene with either a crawl, or a bit of box text, then jump right in to the action! Both the Beginner Game, and the adventure from Free RPG Day start in just this fashion. In the Beginner game, the group is being pursued by a band of vibro-ax-wielding Gamorreans, and have to duck in to a cantina to try and get the jump on them. In the Free RPG day adventure, the party is making their getaway from a successful heist and are being pursued by gangsters on swoop bikes! A droid is driving their getaway vehicle when POW, in an explosion of sparks the driver is destroyed and the party is veering into oncoming speeder traffic. What do you do? Interestingly the first Edge adventure book, Beyond the Rim, did not start this way, and I think it suffered for it. I will do my best to make sure future sessions with that group start with more urgency. 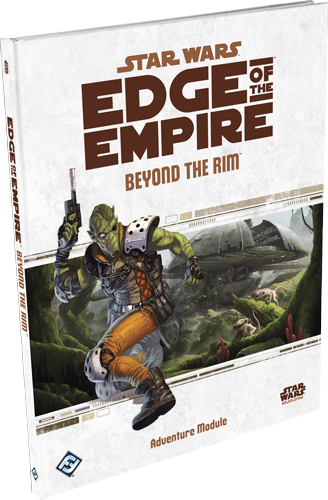 Hope these tips help you run or play in an awesome Edge of the Empire game! If you haven’t tried it yet, check out the beginner game, and start adventuring a long time ago, in a galaxy far, far away!